Faculty members in the College of Natural Sciences are leading new Pop-Up Institutes as part of a new interdisciplinary research initiative at The University of Texas at Austin. Three Pop-Up Institutes were announced this week, with two originating in Natural Sciences. These research efforts will assemble fresh collaborations to address the influence of individual variation on the health and fitness of populations and the impact of discrimination on health outcomes. Pop-Up Institutes are a new campus-wide research initiative designed to address specific goals. Multidisciplinary teams at UT Austin will spend the upcoming academic year preparing for a burst of activity focused on a specific area of research. These Institutes will then ‘Pop Up’ for one month — longer than an academic conference, but less than a dedicated research center or program. Professor of integrative biology Hans Hofmann, who is the director of the Center for Computational Biology and Bioinformatics, will lead one Pop-Up Institute. Called Seeing the Tree AND the Forest: Understanding Individual and Population Variation in Biology, Medicine and Society, it will focus on how variation among a population of individuals determines what makes a population thrive. “Our Pop-Up-Institute will organize a symposium, working groups, and a hackathon to explore transdisciplinary perspectives on the causes and consequences of individual and population variation in biology, medicine and society,” says Hofmann. Another Pop-Up Institute is headed by Stephen Russell, the Priscilla Pond Flawn Regents Professor in Child Development in the School of Human Ecology and incoming chair of the Department of Human Development and Family Sciences. Discrimination and Population Health Disparities will bring together leading health, policy and discrimination scholars to investigate the dramatic implications of discrimination based on race, ethnicity, social class or LGBTQ status for health. “We want to nurture research that will help understand discrimination – and dismantle how it undermines health,” says Russell. The Office of the Vice President for Research will host a Town Hall meeting to introduce the Institutes and their team members on September 15. This event is open to the entire UT community and will provide campus researchers an opportunity to contribute their perspectives to the new Institutes. Scientists at The University of Texas at Austin have developed a new method to rapidly detect a single virus in urine, as reported* this week in the journal Proceedings of the National Academy of Sciences. 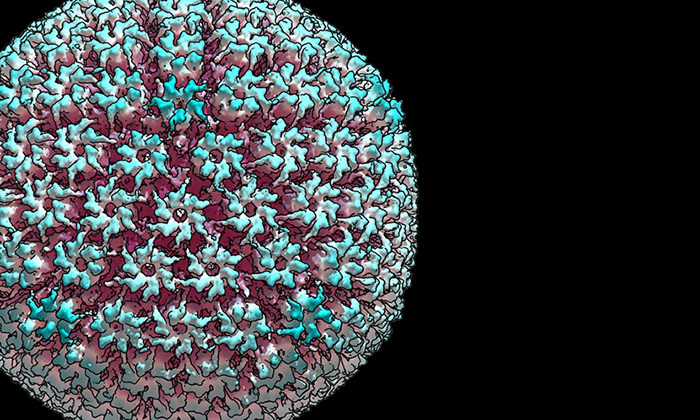 Although the technique presently works on just one virus, scientists say it could be adapted to detect a range of viruses that plague humans including Ebola, Zika and HIV. The new method is highly selective, meaning it is only sensitive to one type of virus, filtering out possible false negatives caused by other viruses or contaminants. There are two other commonly used methods for detecting viruses in biological samples, but they have drawbacks. One requires a much higher concentration of viruses, and the other requires samples to be purified to remove contaminants. The new method, however, can be used with urine straight from a person or animal. The other co-authors are Lauren Strawsine, a postdoctoral fellow in chemistry; Jason Upton, an assistant professor of molecular biosciences; and Allen Bard, professor of chemistry and director of the Center for Electrochemistry. 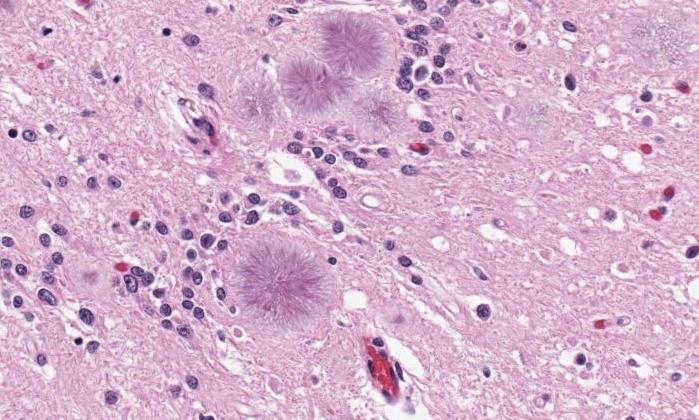 The researchers demonstrated their new technique on a virus that belongs to the same family as the herpes virus, called murine cytomegalovirus (MCMV). To detect individual viruses, the team places an electrode — a wire that conducts electricity, in this case, one that is thinner than a human cell — in a sample of mouse urine. They then add to the urine some special molecules made up of enzymes and antibodies that naturally stick to the virus of interest. When all three stick together and then bump into the electrode, there’s a spike in electric current that can be easily detected. The researchers say their new method still needs refinement. For example, the electrodes become less sensitive over time because a host of other naturally occurring compounds stick to them, leaving less surface area for viruses to interact with them. To be practical, the process will also need to be engineered into a compact and rugged device that can operate in a range of real-world environments. The educational journey of one exceptional student has taken her from translating Arabic in the Air Force to learning the secrets of the stars. Rebecca Larson is a Dean’s Honored Graduate in Astronomy, who will receive bachelor’s degrees in both astronomy and physics at Saturday’s commencement ceremony. She returns to campus in the fall to pursue a Ph.D. in astronomy. 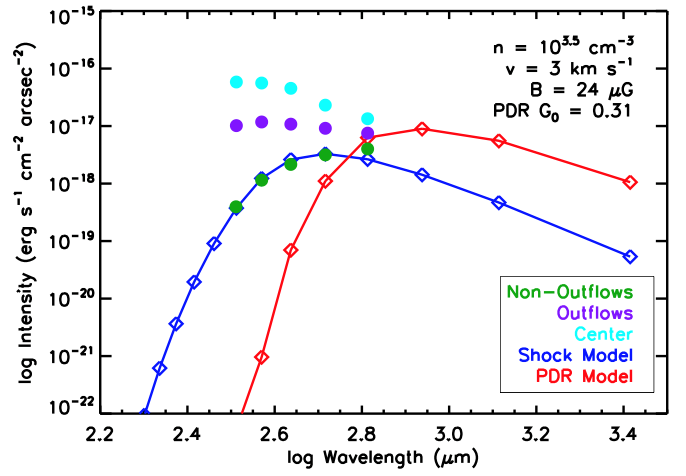 When Larson graduates this weekend, she does so as the first author on a paper published* in one of the highest-impact journals in astrophysics. A veteran, she has spent her time at The University of Texas at Austin as an advocate for improvements in the transfer process for military students and helping to create an inclusive community for those who have served. She is also a founding member of the first women’s astronomy group at UT Austin. The College has about 2,000 graduating seniors this spring, and only a couple dozen are selected for the honor of Dean’s Honored Graduate. There are many compelling individual stories, among the thousands and among the dozens. Larson’s story is one. Her journey to study astronomy in the hallowed halls of UT Austin was long, circuitous and unexpected, with many obstacles along the way. In fact, the biggest surprise was that she never intended to study the stars in the first place. Fate engineered a strange confluence of bureaucracy and happenstance to steer her into a career that she now cannot envision leaving. A military aptitude test revealed a skill for languages, so she entered the Air Force’s intensive Defense Language Institute, graduating with an Associate’s Degree in Arabic. Stationed in Maryland and then Georgia, she supplied translation support for Operation Iraqi Freedom and led a team of ten linguists for the National Security Agency’s stateside office for Sub-Saharan Africa. 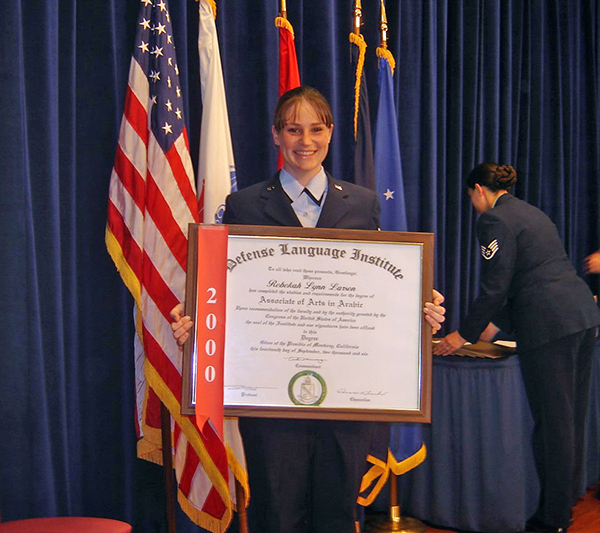 Larson receiving her associate’s degree in Arabic from the Defense Language Institute in 2006. 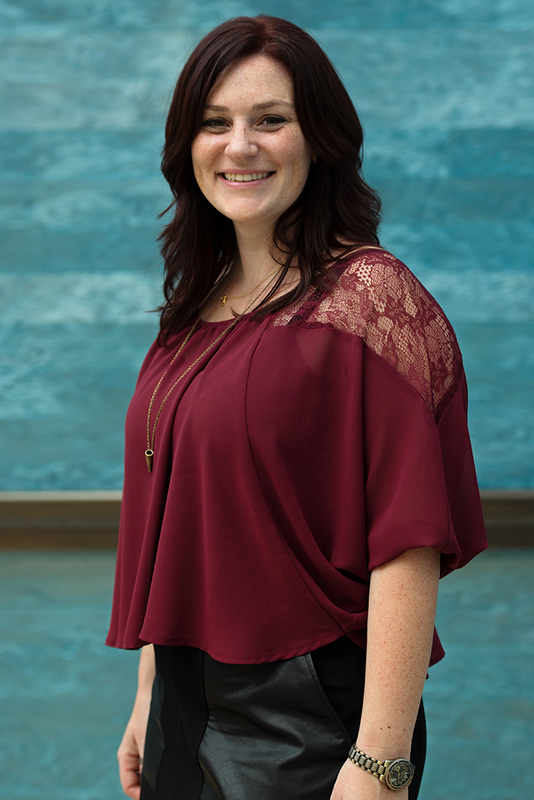 When Larson applied to UT, she brought an impressive transcript with more than 145 credit hours from eight separate institutions. Unfortunately, her transcript turned out to be an impediment. The School of Business wouldn’t allow her to transfer directly in with that many credit hours, and, although she was accepted to enter UT’s School of Undergraduate Studies in the spring of 2013, the week before classes were to begin she learned she also had too many credit hours to remain in that school. She was technically a senior and needed to pick a major. Making matters worse, Larson’s GI Bill was running out. She had to stick with whatever she chose in order to graduate on time or face losing her funding. As Larson scanned the science majors, one caught her eye. She had a love of science fiction and an appreciation for the beauty of space. So, on a whim, she chose astronomy. On that fateful orientation day she met an astronomy counselor. It was a tough first semester, but a required undergraduate studies course captured her imagination. She took Dr. Neal Evans’ course on extraterrestrial life, and that, in turn, led her to research. The data plot that changed Larson’s life. Larson approached Evans to talk about summer research options, explaining that she wanted to get a taste of what it was like to be an astronomer and see if she was on the right path. Evans saw her potential, telling Larson that if she could learn Arabic, she could handle astronomy. That summer, she got a crash course in quantum mechanics from a pair of scientists, enough to get her started in sifting through data. The goal of the research project was to figure out why protostars—stars that are in the process of forming—take longer than expected to develop. One idea was that turbulence from a shockwave could disrupt the process, slowing down or even stopping star formation. Models predict that this turbulence should cause certain molecules to get excited and jump up to a higher state of energy. Larson spent the next year poring through data from the Herschel Space Observatory, looking for the telltale energy spikes. Eventually, she plotted measurements taken from the data and compared it to what the theoretical model predicted. She found a perfect match. Evans was as shocked as she was upon seeing the findings, but after the data and measurements were verified, the results were found to be correct. He offered Larson the opportunity to write up the paper, with her as first author, and she jumped at the chance. The researchers submitted their paper to The Astrophysical Journal, one of the top publications in the field, where it was published in June 2015. 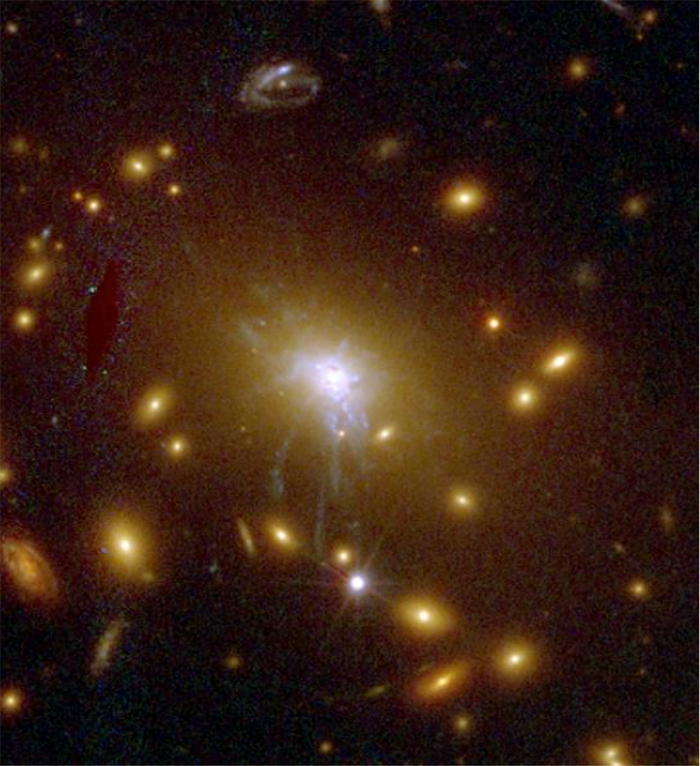 The center of a galaxy cluster that Larson studied at the Space Telescope Science Institute. The next summer, Larson applied for and received a grant through the College’s Texas Institute for Discovery Education in Science (TIDES) to do summer research, characterizing extreme star-forming galaxies in the early Universe, with Dr. Shardha Jogee. The project used a survey of a large swath of the sky that contains more than a million galaxies. Larson, the only undergraduate with a leading role in this international science collaboration, identified several dozen candidate distant extreme galaxies. These galaxies appeared to be producing stars at a rate over a hundred times that of our own Milky Way Galaxy. In her third and final summer, Larson accepted an offer from the Space Astronomy Summer Program to travel to Baltimore, Maryland, where she researched massive galaxies at the center of galaxy clusters with Dr. Marc Postman at the Space Telescope Science Institute. Larson’s work has earned her numerous awards, including the Astronomy Department’s Karl G. Henize Award and Ralph Cutler Greene Award. Through it all, Larson remembered where she came from. She devoted time to improving the lives of Longhorn veterans, working diligently with Student Veteran Services in the Office of the Dean of Students and founding a UT Women Veterans group. She helped encourage the Student Veterans Association to create new mentor programs that pair incoming veterans with a current undergraduate veteran in their field and to organize happy hours, lunches and coffee breaks that present chances to socialize with other veterans. She is currently partnering with a fellow veteran in engineering to create a similar mentor program for incoming graduate student veterans. For her efforts, Larson was awarded the Student Veteran Academic Leadership Award in 2015 and the Outstanding Community Service Award in 2016. Larson also helped create a special transfer orientation for veterans to ensure that what happened to her during her orientation doesn’t happen to others. In addition to her work with veterans, Larson is part of the group that founded the first women’s organization in astronomy at UT, the Association of Women in Astronomy Research and Education (AWARE). As a UT graduate student in astronomy, courtesy of the Astronomy Graduate Excellence Fellowship (a full scholarship), Larson plans to work with Dr. Steve Finkelstein to study galaxies from the very early universe and learn how galaxies evolve over time. Photo credit: James Bowe, via Create Commons Attribution 2.0 Generic license. 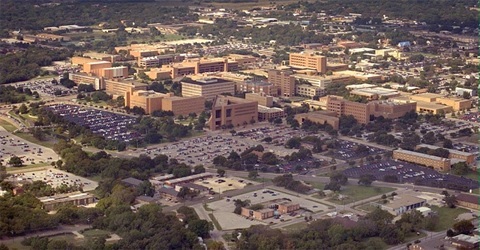 With an advance that one cryptography expert called a “masterpiece,” University of Texas at Austin computer scientists have developed a new method for producing truly random numbers, a breakthrough that could be used to encrypt data, make electronic voting more secure, conduct statistically significant polls and more accurately simulate complex systems such as Earth’s climate. Computer science professor David Zuckerman and graduate student Eshan Chattopadhyay will present research about their method in June at the annual Symposium on Theory of Computing (STOC), the Association for Computing Machinery’s premier theoretical computer science conference. An invitation to present at the conference is based on a rigorous peer review process to evaluate the work’s correctness and significance. Their paper will be one of three receiving the STOC Best Paper Award. The new method takes two weakly random sequences of numbers and turns them into one sequence of truly random numbers. Weakly random sequences, such as air temperatures and stock market prices sampled over time, harbor predictable patterns. Truly random sequences have nothing predictable about them, like a coin toss. The new research seems to defy that old adage in computer programming, “Garbage in, garbage out.” In fact, it’s the latest, most powerful addition to a class of methods that Zuckerman pioneered in the 1990s called randomness extractors. Previous versions of randomness extractors were less practical because they either required that one of the two source sequences be truly random (which presents a chicken or the egg problem) or that both source sequences be close to truly random. This new method sidesteps both of those restrictions and allows the use of two sequences that are only weakly random. An important application for random numbers is in generating keys for data encryption that are hard for hackers to crack. Data encryption is critical for making secure credit card purchases and bank transactions, keeping personal medical data private and shielding military communications from enemies, among many practical applications. 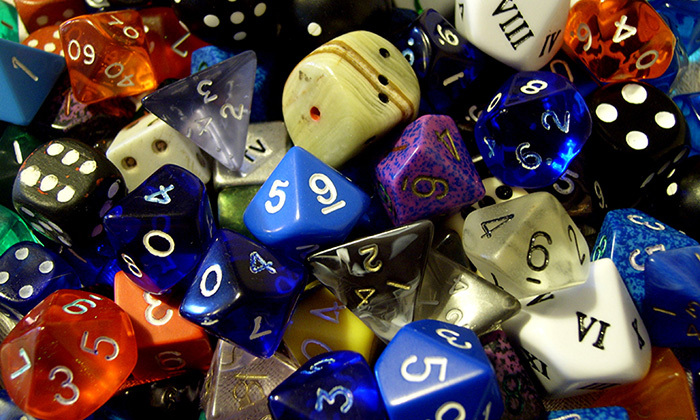 Zuckerman says that although there are already methods for producing high-quality random numbers, they are very computationally demanding. His method produces higher quality randomness with less effort. Their paper shows how to generate only one truly random number – akin to one coin toss – but Zuckerman’s former student Xin Li has already demonstrated how to expand it to create sequences of many more random numbers. The website where Zuckerman and Chattopadhyay posted their draft last summer, called the Electronic Colloquium on Computational Complexity, allows researchers to share their work and receive feedback before publishing final versions in journals or at conferences. Computer scientists and mathematicians have been carefully reviewing the article, providing suggestions and even extending the method to make it more powerful. Karl Gebhardt is an expert in trying to measure the currently un-measureable. The Herman and Joan Suit Professor of Astrophysics in the Department of Astronomy has spent most of his career focused on understanding the role that black holes play in the formation of a galaxy. Now he is helping to lead a new scientific revolution: the quest to understand dark energy, a mysterious force that makes up 70 percent of the matter and energy in the universe. We know nothing. We are very ignorant. All we know is that the universe is expanding at an accelerated rate. We have an idea of what the universe is and how all this material interacts. We believe we understand the laws of gravity. We believe we understand how light evolves over time. But when we go out and try and measure how the universe expands, we find that it is expanding significantly faster than we thought. The phrase “dark energy” is indicative of our misunderstanding of how the universe expands over time. Dark energy may not be dark and it may not be energy — it’s the phrase we use to explain our ignorance. How do you research something we know nothing or very little about? Throughout my career I have been focusing on black holes and dark matter and dark energy. These are all things we cannot see. The only way to measure them is to see their effect on things we can see, like stars, gas or galaxies. With dark energy, for example, we see how the galaxies are distributed and move. From their location and motions we infer what caused them to be in that pattern. You use what you know to infer how it came into that configuration. What is the cocktail-party explanation for how you measure the expansion of the universe? Measuring the expansion rate is really not that hard. When the galaxies are expanding they have a “fingerprint.” Over time, as you grow, the space between each line in your fingerprint expands. You can measure your expansion rate from when you were a little baby just by seeing how far away the lines are in your finger. That’s your expansion rate. For the universe, you look at how galaxies are distributed at various times. You find that pattern and you watch that pattern expand. To capture that pattern we need to make a giant map of the universe. How do you make a map of the universe? My idea is a project called HETDEX — Hobby-Eberly Telescope Dark Energy Experiment. HETDEX is going to measure the position and velocities of about a million galaxies about 10 billion years ago. No one in astronomy has done this before, and the galaxies we are looking at are very faint. So we took one of the biggest telescopes in the world and put on a suite of 150 spectragraphs. And we are going to just sit there and take shots over shots of sky to make a map of the cosmos. It will take about three or four years. How do you gauge success in a theoretical field? What would it mean to “understand” dark energy? A major problem in science is knowing when you are done. Science is really an effort to exclude possibilities. You never really get to the answer. For example, we don’t understand how gravity works yet! That blows my mind. Newton had his ideas. Einstein came in and modified that. And we know Einstein needs modification as well. Dark energy may be yet another kind of hook towards understanding what gravity is doing. So we don’t ever get to a final answer. It just builds up over time. I hope HETDEX is going to be a big advance. We have designed it that way, but you just don’t know what you are going to get. What is your ideal discovery? That we would discover a universe that is not conforming to our standard model. My expectation is we are going to find something that is unexpected. Wait, your ideal discovery is not an answer, but more problems? [Laughing] Not exactly. I’m looking for something out of the box here. When we built HETDEX we thought long and hard about just trying to do better measurement in the nearby universe. Or, should we focus instead at a time that no one has looked at before. The current theory says you might not find a lot if you look that far back in time. And we said, we have to look. Let’s look at a new epoch and see if we can find a differential effect. I think that’s where you learn the most. What roles do innovation and creativity play in your research? Innovation and creativity are huge. That’s what it’s about. When you have a problem like dark energy — and the problem is you don’t have theoretical guidance — it is so hard to design an experiment to observe something that you don’t know what it is. We decided to be creative by looking at a new time in the universe in a way it hasn’t been looked at before. What do you want people to understand about dark energy? We are trying to understand where the universe came from and where it is going. That’s what I like to drive home when I teach a class or talk to the public: Understanding where you stand in relation to the cosmos. It’s very hard to predict if there will be any practical implications in this. Astronomy is just about as out of this world as you can imagine. But just to appreciate our ability as a collective species to understand where we came from and where we are going. It gives a sense of our being. That’s what I love. And that’s what makes us special.